The three cousins Jacky, Jeremy & Keith have setup this nice and cozy restaurant in Pantai Tengah. It's tucked at the end of a lane behind the Sun Mall block and part of the hotel La Pari Pari. It operates independently and open to outside guests as well. Having stayed in Australia and learned the art of creative Asian cuisine, the cousins have come back and set up their own restaurant fatCupid in April 2012. So it's a relatively new restaurant but has already carved out a name for itself in the island. So what's special about fatCupid? It's an open but roof covered restaurant, quite spacious, modern but with touch of art and looks & feels very refreshing. With glass topped tables, sleek chairs and ceiling fans, the restaurant offers a casual & friendly atmosphere. It's set up in a nice garden setting with lots of greenery, plants and trees around. From the tables, you can also enjoy the view of the outdoor swimming pool of the hotel and its cottage like rooms nestled in the garden. So overall the ambience is relaxed and comfortable. While Keith is the chef specializing in Malay, Nyonya (fusion of Chinese and Malay dishes) and Australian fares, Jacky and Jeremy take care of the guests. They are all personally involved in the service of the restaurant along with their staffs. And this ensures that you are well taken care of all the time. Service has been consistently good. Since it is an open restaurant, there could be some problems with mosquitoes particularly in the evenings. The owners have been sensitive enough and offer insect and mosquito repellents to take care of such problems. fatCupid serves all meals including breakfast/brunch, lunch and dinner, and we have tried them all. Amazingly, the food has been consistently good so far. In breakfast try out the Smoked Salmon Croissant Sandwich (RM20), or the Brekkie Sandwich which is a toasted sandwich served with fried eggs, turkey ham and mushrooms (RM19). They have several other items in breakfast including pancakes, omelets with toast, bacon & egg sandwich etc. Nyonya Laksa (RM25) - this is a traditional northern Malaysian laksa having a spicy coconut cream base and served with a choice of bee hoon (rice vermicelli) or mee (egg noodle) or both mixed. Accompaniments include fried tofu, boiled egg, long beans, shredded chicken etc. Other great Nyonya dishes to try are Nasi Sambal Udang (RM27) which is a prawn dish served with vegetables, spiced chicken and rice, and Nasi Ayam Pontay (RM25) which is a chicken dish. Although the menu is not very large, you do get several choices in regular lunch and dinner. In appetizers try out the fish cakes, or go for one of the salads (try out the pumkin & mango salad or the calamari salad, or the beef salad... they are all quite tasty). In the main courses there are two types of choices... casual mains and mains. Casual mains include items like burgers, steaks, fish & chips etc. However, one of our great favorites in the Malay main courses here is the Beef Rendang (RM35) - this is a mildly spiced beef stew with coconut based gravy and served with white rice. Another great item is Chili Prawn Anglio Olio (RM38) - grilled garlic chilly prawns served with pasta. Lamb Kurma (RM45) is excellent too. In desserts go for the banana coconut crepe (something quite different and excellent) or a homemade chocolate brownie. They have a bar (with a stone finished counter) at one end. It serves nice cocktails like the watermelon daiquiri, lemongrass mojito, expresso martini etc. Open 9am - 10.30pm (closed on Mondays). The bar remains open until midnight. You can walk in or make a table reservation in advance. 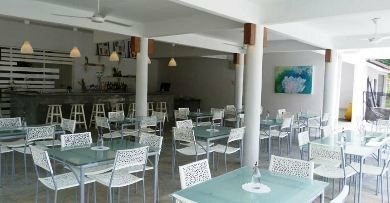 The restaurant is located behind the Sun Mall block in Pantai Tengah past the Green Village Hotel and at the end of a lane. So it's a bit of a walk from the main road.